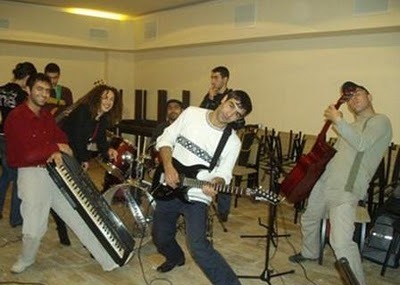 “Some of the guys from my college class gave me a guitar for my birthday and things just took off.” This is how Narek, a 4th year student at Yerevan’s Medical University, describes how the story all began. One day Narek met Zakar at the Student Council where he’d often hang out. Zakar, who would always be in a state of confusion, coming and going aimlessly, took Narek on as a bass player in his group. It all started for Narek about three years back as well when they played a gig at the Medical University’s auditorium. “It was the instruments that brought us together. We never really sat down and decided to form a group. We needed a flute player and then met up with Anushavan. We were missing a guitarist and teamed up with Vagner”, recounts Zakar, one of the founding members of the group Synkope.